We’ve completed the waterproofing process at this house. As you can see in the video, we final graded and it looks really good. A few days ago, this was all completely dug out for the waterproofing process. We’ve completely cleaned up and graded everything on the outside. In the video, I show you the other side and on this property. The windows are high at this house so they didn’t require window wells, however most do. Each one of these walls was excavated to put a waterproofing membrane on. We straightened the wall on the far side. As you can see on the backside as well, we’ve completed everything and moved things back and graded. 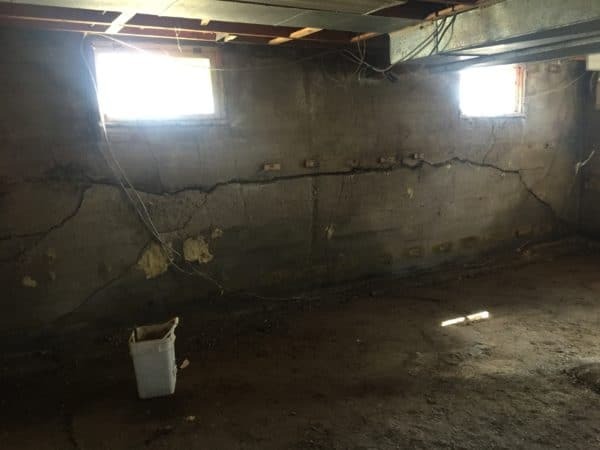 This is the basement of the same property I was showing outside. It’s in the Rosemont area of Regina. Inside, we’re doing some bracing and as of this video, we’ve just started so the guys are hanging it (the steel bracing). As you can see, the floor has been removed so this will be getting a new floor as well. That wall is the wall that we straightened on the outside and it was in rather rough condition as it was caving inwards as far as 4 inches in some places and so we’ve straightened it. It’s a driveway wall and it isn’t uncommon that they take the brunt of the force of movement of the clay which pushes the wall in. We’ve since straightened it and it’s in quite good shape. You can the reason why we’re doing the bracing with these big cracks in the walls. The driveway wall used to be pushed in about 4 inches. Now as you look, the wall is plumb and straight. 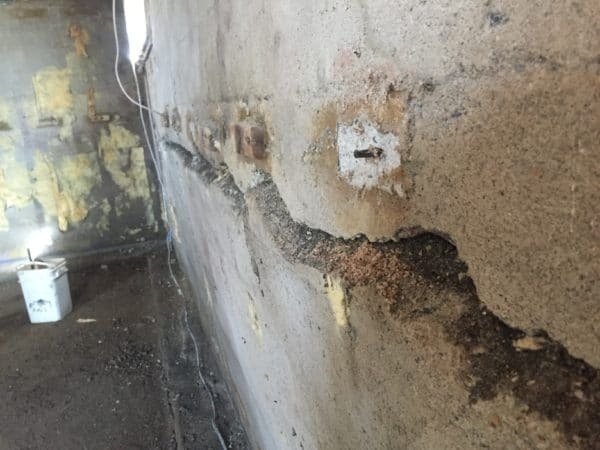 I have pictures from before which gives you a good idea of the condition this wall was in so the guys did a great job of straightening it. Have a good day and hope to hear from you soon! Cheers! 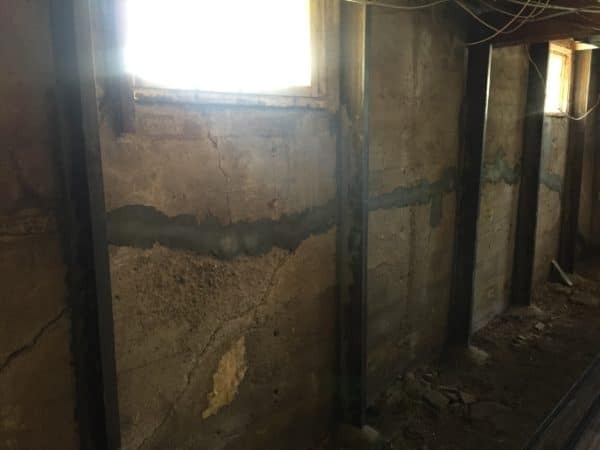 Do you have a wet leaky basement and are you in need of basement or foundation repair in Regina, Saskatchewan? 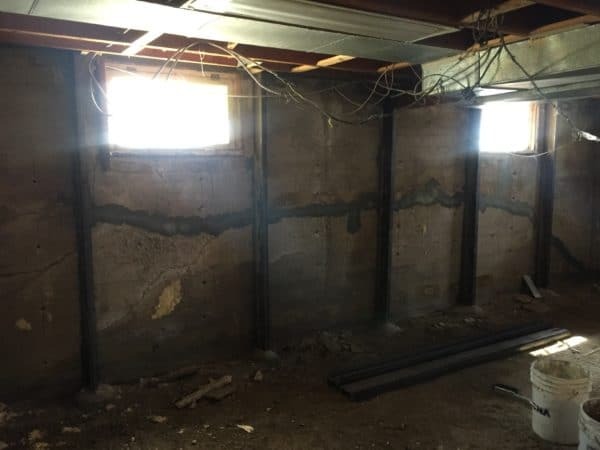 For over 10 years, JS Basement Works has been Regina’s premiere home for basement and foundation repair.